One of the best books to come out on Joplin history is now available in paperback and electronic book format. 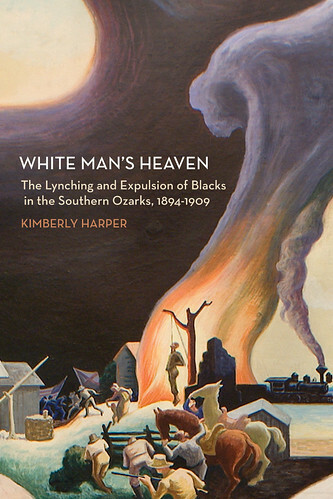 White Man’s Heaven, by Kimberly Harper, chronicles the 1903 Joplin lynching of Thomas Gilyard and ensuing race riot, among similar events in other Southwest Missouri cities. In addition to outstanding reviews, White Man’s Heaven recently won the Missouri Humanities Award for Distinguished Achievement in Non-Fiction. You can now pick up White Man’s Heaven in Paperback from such places as Amazon.com and Barnes & Noble online. In addition, an e-book version is available at GooglePlay and and iTunes. From 1pm to 5 today, you can visit the Post Memorial Art Reference Library to see artifacts of Joplin’s past. Ranging from a key to the Connor Hotel to an embroidered towel from the Keystone Hotel, plus a number of other items, you have the chance to get a glimpse of Joplin’s past through “fragments of people lives.” The items come from the collection of Mark and Paula Callihan. Additionally, also on display are a number of tornado recovery posters created to benefit Joplin charity in the months that followed last year’s catastrophe. The Post Memorial Art Reference Library is located inside the Joplin Public Library. Today’s post is a link to an in-depth article on the architect of the Joplin Union Depot, Louis Curtiss. The article comes from the Places: the online journal of The Design Observer Group and is written by University of Missouri Professor of Architectural History and American Art, Dr. Keith Eggener. The article offers an insightful biography of Curtiss and explores how and why Curtiss and his works, such as the Joplin Union Depot, slipped into obscurity when contemporaries later became nationally renown. 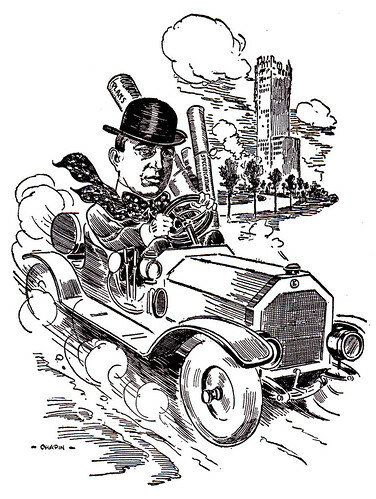 You can find the article here, “Louis Curtiss and the Politics of Architectural Reputation”. In 1902, business interests in Joplin wanted to promote their city and did so by publishing The City That Jack Built, a photograph booklet that covered Joplin’s business, industry, and the residences that its mineral wealth had built. Quite a while ago, we scanned in our copy of the booklet and made it available on Flickr here. However, we thought it might be fun to present the photographs to you in the form of a video slideshow, linked below. For more information on the photographs featured in the slideshow, check out the Flickr page and select the image to find out the name of the home, business, or industry. Simpson’s latest book is a wonderful love letter to Joplin, a fine work that covers the history of the city from its establishment in 1873 to the present day. It is a lavishly illustrated postcard history of the city accompanied by detailed, informative captions. The book provides readers with an understanding of the people, places, and events that shaped Joplin into the city that it is today. Simpson does an excellent job of balancing the past and present so that readers are taken through Joplin’s early years, subsequent growth, Route 66 years, up until the time of the tornado. The book is helpfully divided into nine sections that cover different topics such as mining, industry, residences, schools, churches, and hotels. Although one might expect that because the book is postcard history the book might be poorly researched, it is not. The captions for each illustration are insightful, well written, and historically accurate. Each illustration has been carefully chosen and offer unique glimpses into Joplin’s social, cultural, religious, and architectural history. Sadly, Simpson’s work illustrates just how many Joplin buildings and other landmarks have been lost to the ravages of time, benign neglect, or lack of vision. Our advance copy notes that “Profits from the sale of this book will be donated to the Joplin Chamber of Commerce Business Recovery Fund” so you can be assured that your money will go to a good cause. We also recommend that you might consider giving a donation the Post Memorial Art Reference Library. Those who own Leslie Simpson’s prior works may recognize some, but not all of the images used, however all offer entertaining glimpses into Joplin’s past. For those who have and enjoyed the above mentioned Now and Then and Again, they have a great companion to Joplin. Joplin is a well written and illustrated history of Joplin, Missouri. It is accessible to readers of most ages and is a enjoyable read for those who enjoy local history, the history of Joplin, and illustrated histories. Hopefully it will leave most readers with an even greater appreciation for the City that Jack Built. Leslie Simpson, Director of the Post-Memorial Art Reference Library, has a new book coming out on Joplin history, appropriately titled, Joplin. The book is a history of Joplin as told “in hundreds of vintage images” and will be launched at an event at Hastings on September 24, this Saturday, at 10:00 AM. Profits from the first printing will go exclusively to the Joplin Chamber of Commerce Business Recovery Fund. Once we get a hold of a copy, we’ll be posting a review. Until then, please find the press release below concerning the event below! book that tells the story of Joplin’s past in hundreds of vintage images. the book to the Joplin Chamber of Commerce Business Recovery Fund. 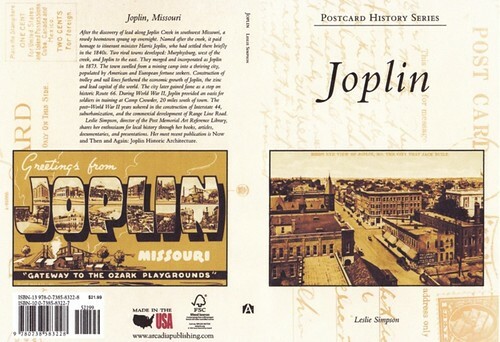 Joplin will be exclusively available at Hastings through October 2011.
publisher at www.arcadiapublishing.com, or by calling (888)-313-2665. Come share your own stories. Take a walk back in time. book, Joplin, by Leslie Simpson. Hastings located at 526 South Range Line Road. of Commerce Business Recovery Fund. The following story is taken from Bud Belden’s memoir “Pioneering Days.” His father, Charles Belden, founded Belden Electric Company and wired many Joplin homes for electricity. “When engaged in wiring the residence of O.S. Picher the boys discovered a case of Scotch Whiskey. Being alone in the house they placed a bottle on the kitchen table where all could wet their whistle as they passed by. Unexpectedly Mr. Picher returned about 4 P.M. and immediately work centered in the basement and in the attic. But when any of the malcreants did appear, Mr. Picher no doubt noticed their unusually bright and shining eyes as they peered at him from dirty faces. Being an observant man, Mr. Picher noticed this condition was general among all members of the crew. Now there was a regular fellow. Sure, the day was finished, they would be glad to. O.S. then assembled them not in the kitchen but in the dining room and served them in manner grand. Iced ginger ale in tall gold rimmed glasses with White Horse Scotch Whiskey. They were a sorry lot weaving around in dirty overalls but they sang the praises of Mr. Picher loud and long. In the most recent issue of the Joplin Metro Magazine, Issue 11, the pickings are regrettably slim for pieces of Joplin history. 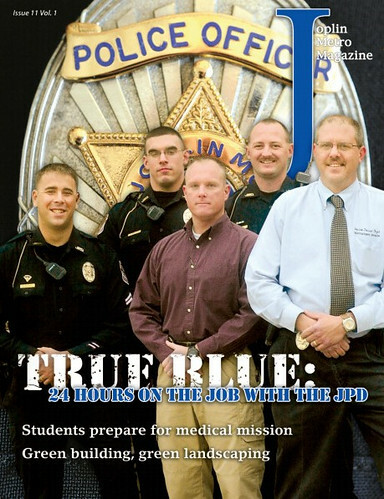 The lengthy article on the Joplin Police Department has some information on the history of the department, including a list of officers who have fallen in the line of duty. The murder of one officer on the list, Officer Theodore Leslie, sparked the lynching of Thomas Gilyard. For more details on that murder and the lynching, pick up a copy of White Man’s Heaven, by Kimberly Harper. You can learn more about the Joplin Police Department on Historic Joplin here. 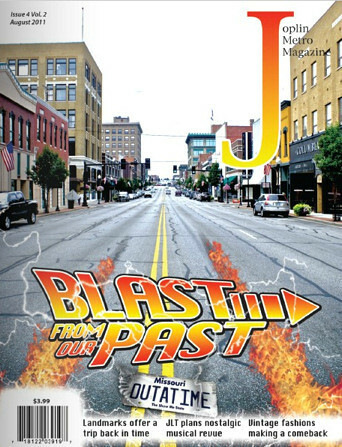 Copies of the Joplin Metro Magazine can be found around Joplin in businesses, including the lobby of the Joplin Globe building.